Long ago, when I first gave my heart to Jesus, I spent time sojourning in some churches that were rather restrained in outward or individual emotional displays during worship. It was a really big deal if someone lifted a hand up, or even two hands, during the worship time: enough to provoke entire late night conversations among the youth group (which I was part of at the time). Questions abounded: “Why would anyone do this? Was their hand like some sort of God antennae? Were they feeling something at that moment that the rest of us weren’t privy to, that resulted in the hand being raised? What was all that about?” But the biggest question that would eventually emerge in these conversations was this one: Was this person’s outward display of worship creating a distraction for the rest of the congregation? Additionally, there is also a concept in the “worship-freedom” loving churches, that the Lord’s worship and praise ought to be extravagant – that people lavishing expressions of unbridled emotion and awe and love and whatever else towards the Lord in a corporate setting, with no concern for how others might view those personal expressions of love and praise, is something honoring to the Lord, something of which He is worthy. 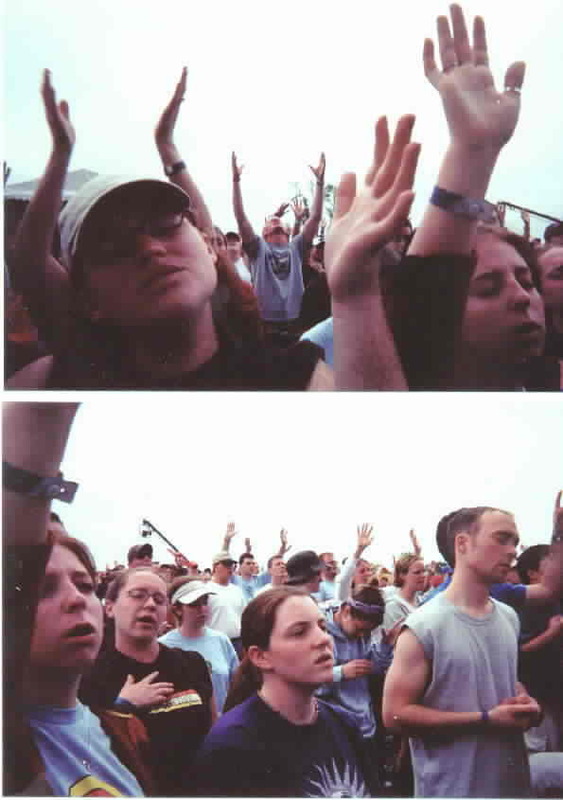 Thus worshipping in this manner is not something done just for one’s own emotional satisfaction, but is regarded instead as a personal offering of eschewing one’s regard for their own appearance, dignity, etiquette and personal composure, to instead bring a gift of wholehearted, expressive, and whole-bodied praise towards God. I have to admit that over the years I’ve definitely become more partial towards the latter paradigm of group worship than the former. From this vantage point, what in my early years was once considered a potential “distraction” -seeing someone else express individual worship and praise in a unique, creative, and less-conformist-to-everyone-else way, is no longer something that I see as a distraction. In the mindset of the “freedom” concept of worship, a brother or sister’s creative worship expression, which I once viewed as a distraction stealing my attention from focusing on God, is something I instead now consider to be mutual “edification” – something that helps me see God even better. Seeing a fellow worshiper be demonstrative in how they worship or pray to me now is a chance to see their faith being expressed, which in turn is something which bolsters my own faith and experience of meeting with God. But it took a change in my mindset for me to be able to view someone else’s spiritual expression as something that I could receive as a beneficial aspect of Christ being made known to me through His people. I now see this as the living faith in one person’s heart being made known to mine; and then in turn, my own worship being made known to those worshiping with me as well, creating a mutually reinforcing dynamic. On a human, sociological, natural level this is psychologically supportive of one another’s faith expressions, but on a deeper, more supernatural level, also is an arena where the Spirit of God is able to express His own nature corporately, through the weak yet creative expressions of His people who are passing expressed faith back and forth to one another in their full-bodied signals to Him and to one another. But it did take a shift in mindset – if worship is about me and God being alone, and undistracted, to have this inner exchange of prayer, worship, honor, love, repentance, etc., then the question becomes: “Why gather together with other believers for worship at all?” If worship is a private thing, where I shouldn’t notice your worship and you shouldn’t notice mine, then why do we bother coming TOGETHER to do it? God *can* be encountered out in the woods, or on the seashore, or on my bed or in my living room, or alone in my car – so why not just let that be sufficient? I think the reality is, as I’ve written before: we need both. We need to experience God in our closets, alone, or at the seashore, alone. We each NEED to have a unique connection to our Creator that doesn’t depend on man. But we just can’t pass over the fact that if we believe the New Testament scriptures (and I’m writing mostly to Christians here as I write this) that the overwhelming testimony of that scripture is that God Himself is really into this concept, of believers in Jesus sharing a corporate experience of Christ – what is called being the “body of Christ” together. Being the body can be a simply static concept: we are the body of Christ whether we get together or not – but this concept can be realized as also an experience-able concept, something which if when we get together and have some idea what we’re doing to gather “in the name of Christ” together moves from being a mere doctrine into a functional reality. The mystery of “Christ in you, the hope of glory” (the “you” in that verse being a plural you) is that there are new facets to knowing Christ, and to worshiping Him, or gathering with Him, that really can only be realized when we do this in conjunction with one another, functioning no longer just as individuals alone, but individuals in connection with one another, experiencing the dynamic that results from each person’s faith expressions feeding into the others’. This is why so many people will share that something unique occurs when they worship with corporately – that they have an experience with the Spirit of God that is unique and cherished apart from what they have with Him while they are by themselves. And it has something to do with each of us bringing something of our own heart with God to each other, where the whole of the corporate expression becomes greater than the sum of its own individual expressive parts. It’s like what you see when a flock of birds fly overhead – a bird flying is just a bird, which is a marvelous thing. But when hundreds of birds come together and each of them does its own little flying part, suddenly a whole new structure of expression is seen in the sky, as the flock moves in a way that creates new shapes, new forms, and new expressions of movement that any individual bird could never demonstrate to an observer. When you’re *in* that flock of birds, you can undoubtedly see some angle on this unique thing that is happening even while you are in it – and, you get a chance to see where your own little part becomes an expression of something so much greater than yourself – it gives new dimensions to your own experience of being a bird, to fly along with the others. This post is not meant, however, as some sort of “you need to go to church” sermon, as it may be tasting right now to some of my readers. Church can be valuable to the degree that it truly gives you a chance to experience being part of the body of Christ with others. Or, it can itself unfortunately at times be the single most distracting element that believers experience to truly being the body of Christ with one another – it depends on the church, its way of being, its beliefs, its leadership and its format of meeting. Church is simply a scaffold, a structure, for people to be in spiritual life with one another. And a structure can be something that living things thrive on – and build life on, like a coral reef growing on the structure of a sunken ship or stone outcrops, or a tomato plant being helped along with a stake for it to grow around. Or structure can be something averse to life, something which destroys it – like putting a Walmart building and parking lot into a former wetland area. Some of my readers would find their spiritual life greatly enhanced by leaving their church, and others need to find one. I’m not making any statement about your own situation in regards to that, because how could I even begin to know? But my goal here in this post is simply to point out: that there has long been this tension in the body of Christ between knowing what constitutes a corporate “distraction” from Christ for one another, and what actually constitutes a valuable opportunity to edify one another’s faith by each member of the body bringing their own expression of knowing Him to the corporate table. And I think that we can meaningfully distract one another right into loving Him more, as we offer our own distracting expressions of knowing Him and loving Him to one another. Some of my friends on FB know that, back in May, I was at a friend’s house during a late night power outage, and slipped on an unusually shaped/sized step going into her kitchen to get a candle, and simultaneously broke a bone in my foot while tearing a tendon in my ankle. It was a VERY slow-healing fracture (the 5th metatarsal is a notoriously difficult bone for fracture healing) and it turns out that the torn tendon is an even bigger, more long-term issue than that. Four months later, and I was just starting to be able to walk again, albeit with the help of crutches and physical therapy. Here, at the fifth month mark, I can now hobble around the house without crutches, but generally when I go out in public I still use the crutches for otherwise painful occasions, like shopping, where I’ll need to walk more than a few feet at a time. This past weekend I was not feeling all that ambitious, so I took my crutches with me as I visited…a new [charismatic] church. My friend who went with me remarked on our way to the car, “Do you think they’ll call you up to the front to pray for you to be healed?” I replied, “No, I doubt they’d do that. I don’t think what from what I know of this church that that would be their style. But – I bet they’ll get me in their lobby after the service is over.” I was really actually not hoping this to be the case – but we were mostly teasing each other with the comments. So I walked into the church, feeling like I had a bullseye on my back, saying, “Aim prayers here.” I was glad when we found an empty pew, and I could lay down my crutches and be “normal” again. It’s not that I don’t like prayer – I actually do like prayer. It’s just that there’s something about the way people accost people when they want to try out their healing ju-ju on them that is very uncomfortable to me in some ways – especially when the prayer is not asked for, and the person is a stranger. Anyway, we sat through the service, and both my friend and I found the teaching time to be really down-to-earth, basic, but solid stuff. So solid in fact that we sat there for at least a good 5 minutes after the meeting was over, just processing together some of the heart issues that were brought up for both of us. Meanwhile, the room grew emptier. So we finally got up to leave. Back in the lobby, my friend went to look for a pen to fill out the visitor card that would earn us a “free CD” as first time visitors, and I stood there a moment waiting, when an attractive and trendy guy came up to me and introduced himself. He talked to me for a little bit and seemed strangely friendly and interested in me, beyond what I would normally expect from an attractive and trendy guy on first meeting. I honestly wondered at his interest in me – was he trying to pick me up? Call it low self-esteem, but that seemed highly improbable. So what was with this dude? Men of this caliber, unfortunately, rarely even speak with me – let alone speak to me with such a level of personal interest. And then came the question – the question that instantly brought me back to reality and immediately removed all questions from my mind. “So,” he asked, “on a scale from 1 to 10, how bad would you say your ankle hurts right now?” And right then and there, I knew. Not because I was intuitive, no, but because he was following the ‘script’ – the latest charismatic formula for how someone who has been trained in ‘healing’ in any of the big name ‘healing schools’ or conferences is trained to approach their victim – I mean – the person they want to try healing. How the script is supposed to go is like this: you ask the person how bad their pain is on a quantitative scale, from 1 to 10. Then you ask to pray for them. You ask to touch them and lay your hand on the part that hurts, if possible. Then after you command that part of their body to be healed, you ask them if they felt anything. And you ask them if the pain has decreased – and you get another number on the scale from them. Then you ask to pray again to get the pain to go down the scale further. Then you check your ‘patient’ and ask again if the pain is any less. And you keep repeating the process, over and over and over, until the patient finally says they are in much less pain, or that they are healed. Then you ask them to do something that would have been painful earlier, like if they had shoulder pain, to lift their arm above their head or something. This is a pattern – a template even, for how the interaction between the healer and healee is to be carried out. So my new friend of the moment asked me how my foot felt on a scale of 1 to 10, and I instantly knew that my earlier prognostication that I would be the recipient of healing prayer ministry in the lobby after the service, was instantly proven accurate. Yay. I cut to the chase. I told him, “The pain is only around a 2 right now, because the crutches are bearing my weight for me. But if you want to pray for my foot, you’re more than welcome to do so.” Heck, it’s not the prayer itself that bugs me. Since he was here, I’d receive the prayer. So he prayed…and commanded…the ankle to heal. Then he got up and predictably, asked me if I felt anything happening. I told him, honestly – no, I didn’t. I saw him getting ready to go for round two…and I just didn’t want to go through that whole entire process of pray, ask, repeat – pray, ask, repeat. I wonder, if this formula was designed knowing that people eventually feel so much pressure to say, “Yeah, yeah, the pain has gone down” that they eventually just give in and say that? I know from my past run ins with this form of prayer that there comes a point when I feel so pressured to just say something has happened just because it feels like the person will never let you go otherwise. Anyway, I didn’t want to go through the whole process, so I cut to the chase again, thanked him for his one prayer, and told him the honest to God truth: I have experienced healing before. But it has never, ever happened to me while someone was actually in the process of prayer with me. There are people in churches and groups I have been in that have never been interested in knowing me, or being friends with me. But when they host an Avon party or an Amway party or some other sort of “get everyone who has a checkbook to come to your party” type party, they never fail to invite me. And for me, it always goes something like, “Wow, you are talking to me? You are inviting me to a party? Wow – thank you – I’ve been really hoping to get to know you all this time and i always got the impression you didn’t think I was cool enough to know.” And then, just as my hope is rising, I realize – oh, wait. It’s not a real party. It’s not a social invitation. It’s a business. They only invited me to THIS party because of the fact that they need customers. And unfortunately, that’s sort of how I felt with Mr. Cute Healing Guy. (He was married it turned out – which is fine. He’s probably married to someone as cute as he is – but wow, it would have been so amazing for my friend and I to get invited to go to a meal with Mr. and Mrs. Trendy after church, and all get to know each other. That would have been totally banging. But that’s not what this was about.) You see, this is what I think it was about. No, he didn’t want money from me. But, I can’t help but think he saw me, not as a someone to know, but as someone to practice on. In these healing seminars, where these methods are taught, one other thing is taught: that the big guys, like John Wimber, who learned how to “do the stuff” and really heal people, prayed for something like 500 people first without a single miracle, before they got their first healing. So you have to just get out there and practice, practice, practice. And how do you practice unless you can find people to practice on? That’s what I think I was to this guy – an injured object for him to practice on. Not someone he wanted to know…. not someone he even really truly cared about, but just, a chance for him to try out his stuff. Does that sound bleak and bitter? I suppose I could go to that church 10 more times, and see if he ever talks to me again – or if he ever talks to me about anything other than, “How is your foot? Would it be ok if I tried praying for your foot again?” But I will concede: perhaps I am wrong about this guy’s intentions. The thing is, even if I am reading the wrong thing here with him, I know one thing is certain: this blog post is worth publishing, because there are thousands of other people being taught to do exactly what this guy did, and this blog post would not be wrong about the intentions of the majority of them. Thus, I now hit publish, and you are invited to comment.